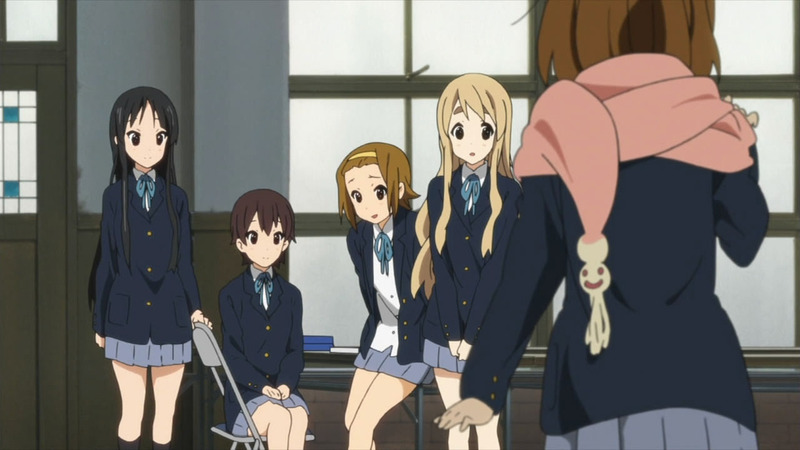 Now that Yui and the others have finished their entrance exams and gotten into their school of choice together, there’s nothing left to do but wait around for their graduation ceremony. 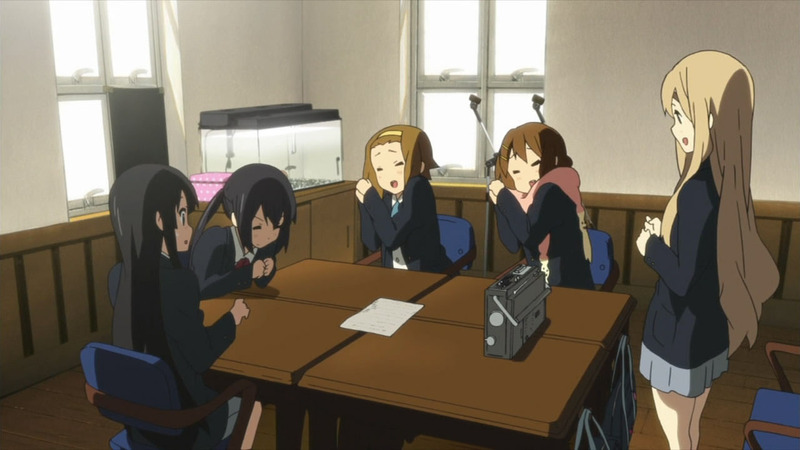 Hanging out in their clubroom one last time was on the itinerary, as was leaving behind a memento of all of Houkago Tea Time’s songs. While I would’ve been perfectly fine if they just filled the entire episode with their recording session, the real tease from not showing any of it are the two songs on their list that we’ve never heard before. 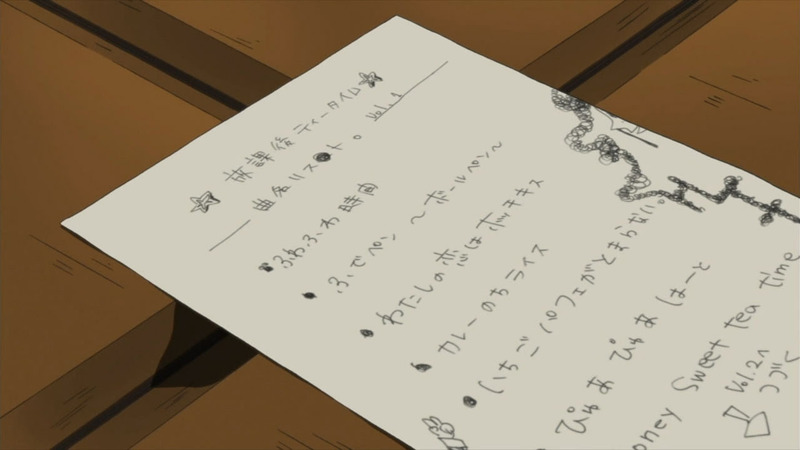 The first one, “Ichigo Parfait ga Tomaranai”, was actually seen all the way back in episode one, whereas the second one, “Honey Sweet Tea Time”, sounds like it’s labeled to be a Mio-sung song. 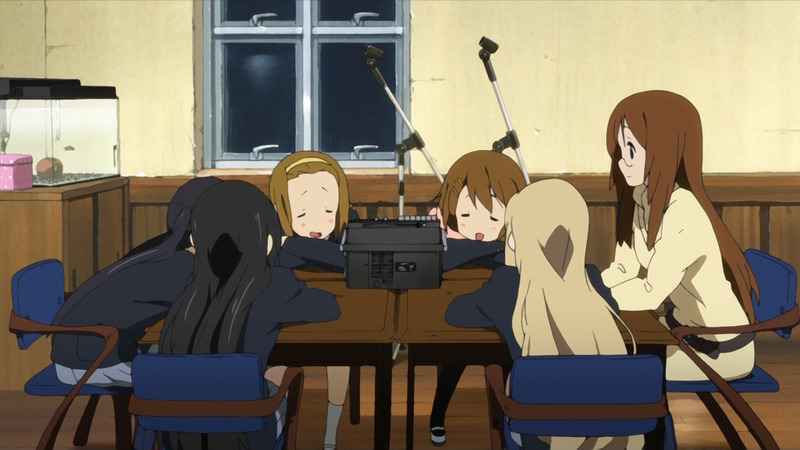 As such, all I could think about when this episode drew to a close was how much I’d like to get my hands on that cassette tape they left behind. Heck, I even have cassette players to play it and can dub it to another tape just to preserve the more ghetto feel. It’s Old School Tea Time! Mp3 what now? 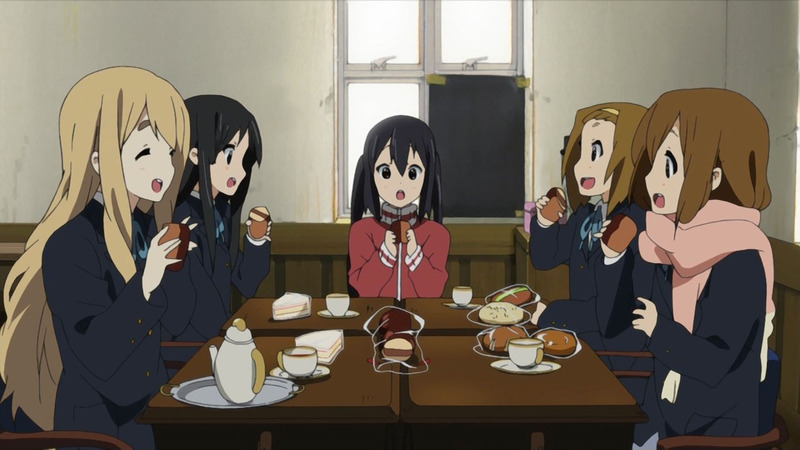 Anyway, I’m wondering if Pony Canyon plans to release a complete Houkago Tea Time album once this series ends and include those two songs on it, because it seems a bit strange cruel to simply throw out song titles with no intention of writing an actual song for it. 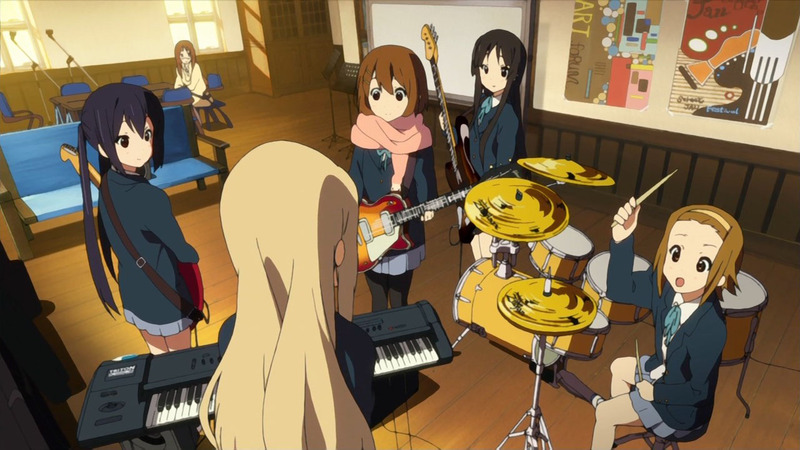 The other possibility is that they can save them as a huge surprise for the next K-ON Live Event and release them as another single afterward to milk it to death, assuming there’s going to be another live in the future. (Common (business) sense says there will be.) Whatever the case, it’s probably safe to assume the school festival performances of “Gohan wa Okazu” and “U & I” are the last songs we’ll hear in the series itself. Things are in a pure wind down stage now, where the girls are just trying lounging around killing time and trying to do some things in high school they haven’t yet, such as cleaning their clubroom (*gasp*). It’s quite a shock I know, just like how they’ve never eaten the highly sought after “Golden Chocolate Bread” when Azusa, Ui, and Jun all have already. 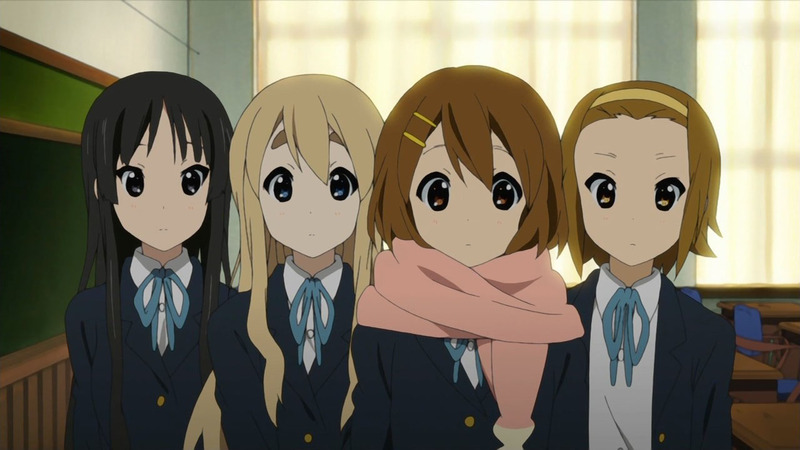 There was nothing on the Azusa front nor the future of the music club next year, which means it can either continue on if Ui, Jun, and one new member join, or go dormant again just like when this series started. The actual outcome isn’t important it would seem, as most of this episode was fairly laid back and unassuming in typical K-ON fashion. 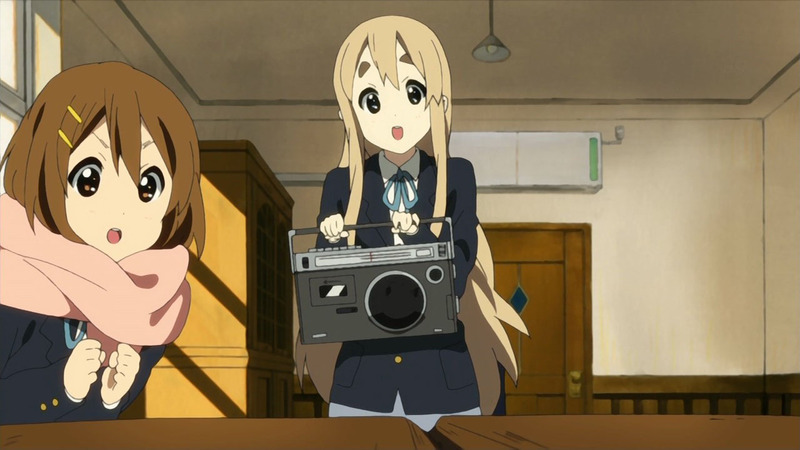 My personal highlights were Yui in Nodoka’s glasses and trying to look sophisticated, Nodoka without them, Azusa’s surprise over Yui’s usage of the word “musicianship” (just like in live event skit), and most of all, Mio and Azusa not liking the sound of their own voices when Mugi decided to record their useless chatter as well. 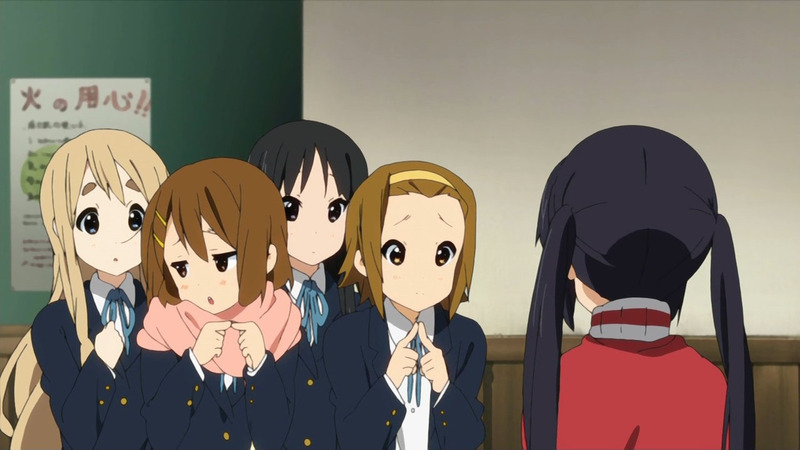 Azusa takes the cake in the last one, after getting embarrassed over how she sounds yelling and even apologizing for getting on everyone’s case all this time. Laughing out loud to that almost came instinctively for me, because she finally realized how uptight she sounds. Aside from that, I would probably consider this a deceivingly peaceful episode. The reason being, the next one is the last. However, that’s only story-wise, as TBS and all the other stations have two more bonus episodes scheduled to air in the following weeks, one of which I suspect will be a recap type of episode like Kyoto Animation did for CLANNAD. Whether or not the “finale” next time will be a tearful one remains to be seen, but I’m really not expecting it to be when episode twenty delivered in that department. In any case, we got the kleenex box ready. This episode could be the quiet moment before the storm. 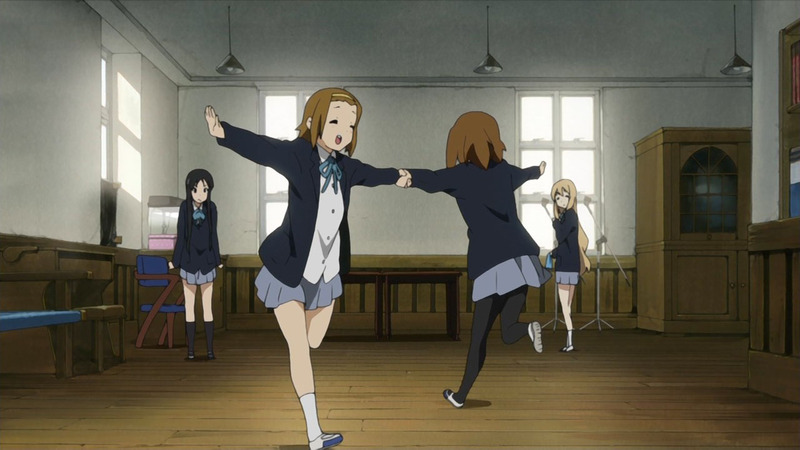 This K-ON!! was almost too laid back, I got really excited they were going to play new song to close the episode “I was like this :), then I like this :(” with the big tease. Very unlikely that Ritsu chapter’s going to get animated, because this is not season 1 where 2 beach episodes are acceptable. We already have a someonesuspectssomeonehasaboyfriend/stalking/foundoutitsactuallyagirl episode around 3 months back. From here onwards it’s unlikely much, if any part of the manga will be animated at all. Specially Nodoka’s chapter. It’s like KyoAni shoved her to the sides. But anyway I hope they include that in the specials and not go for the Afterstory way of special episodes. I’d rage so hard if it’s just a recollection or recap episode. I mean c’mon don’t waste that time. IIEEEE!!!!!!! KYOANI, DON’T MAKE THE LAST TWO EPS. BE JUST RECAPS!!! kyonkun, I didn’t follow the manga that far but what BF are you talking about? Yeah, me neither. I didn’t read the manga. Poor Azusa… I hope they can provide some closure for the finale and not leave it at a point where she ends up miserable and alone without HTT. 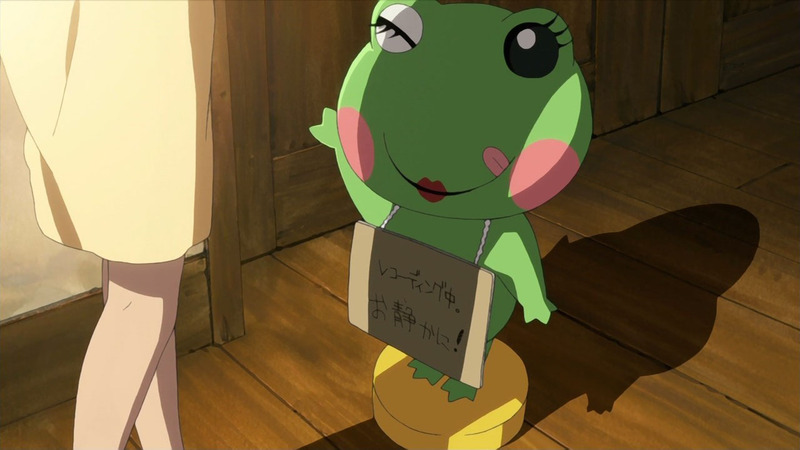 Also, I wonder what Kyoto Animation is animating next. 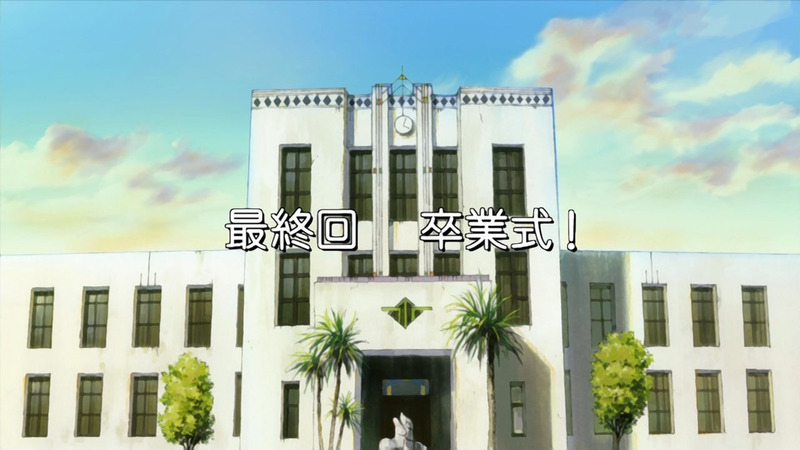 I wish they could go back to their roots and adapt Key titles (namely Little Busters), or continue on with FMP. Two things… The bell and the cassette tape.. Feels bad man… When they were sitting down and the bell rings. They all tune in to that sound. Anyway.. Since next last week is the final official episode the manga also ended recently. Well.. Let’s see how KyoAni does that. 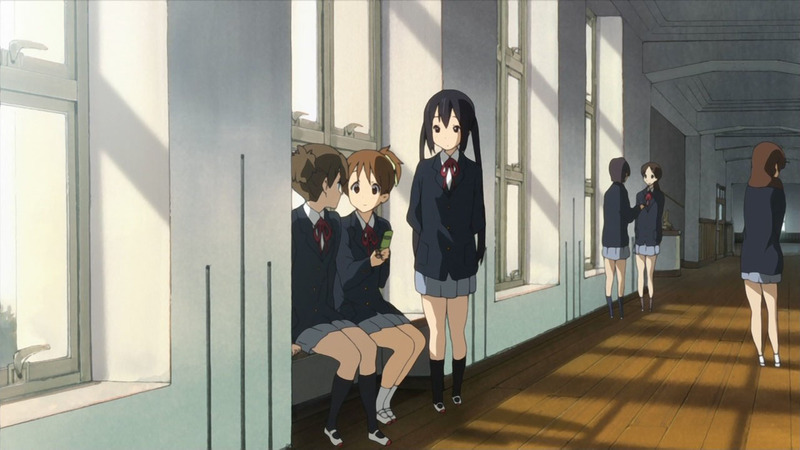 I wonder if Azusa will run up the stairs and find a empty room? or someone waiting there? 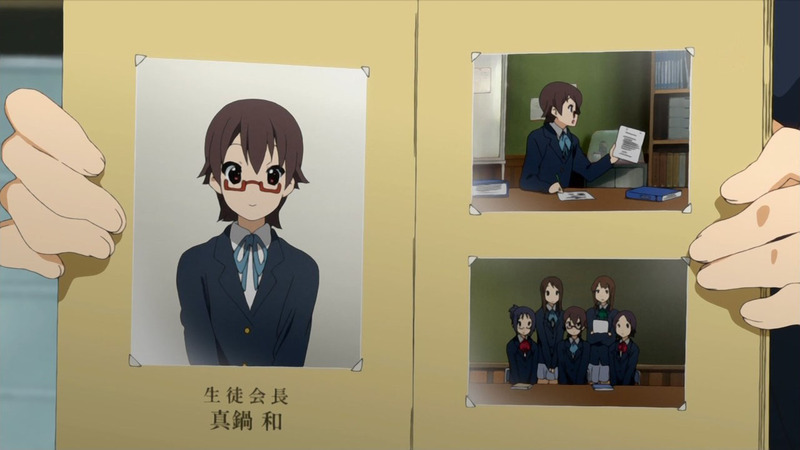 in the final hmmm…..
It’b nice if Azusa gets members to go with her. They said that Ui and Jun are joining the club. OBVIOUSLY enough. 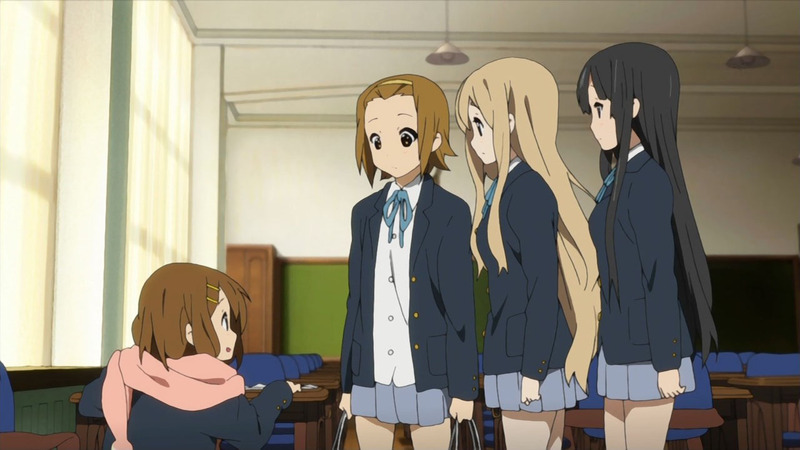 But the thing is there are only 3 of them which brings it back to the same problem that Ritsu had when revived the club. 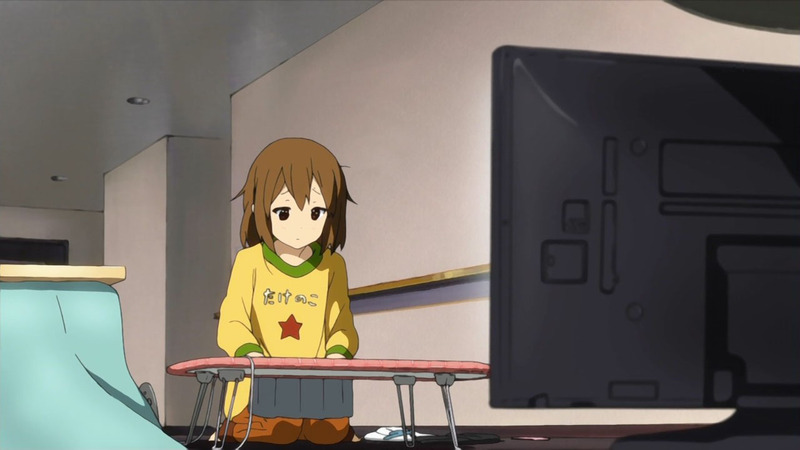 They say Azusa fans might want to refrain from watching (or reading) the K-ON! finale. 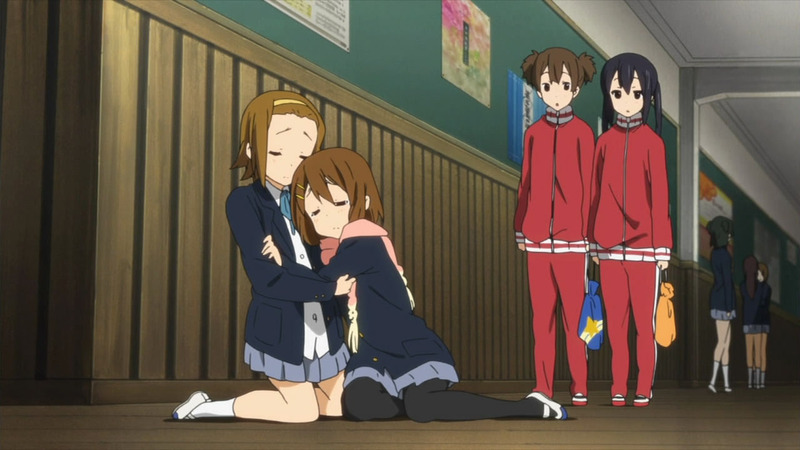 And yes, kyonkun, it will be a massive Azusa meltdown. 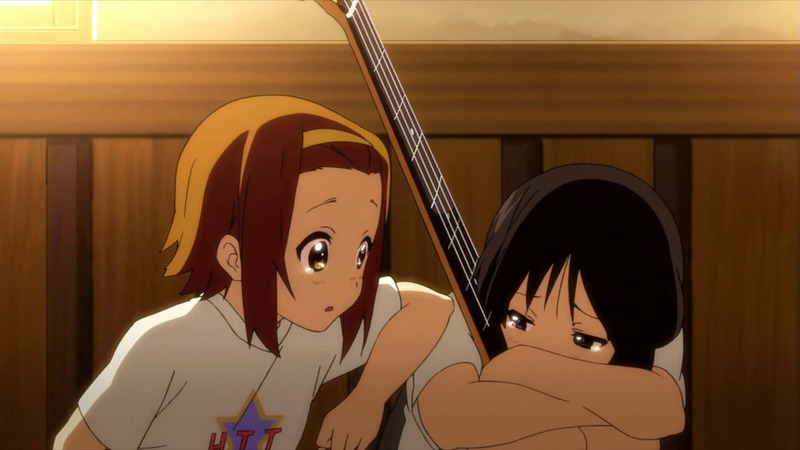 Whether what I’m saying is based on a troll or not, my guess is Azusa will cry. I mean, after two years of being with HTT and the seniors leaving for JWU, who wouldn’t? I wanna see that happen. 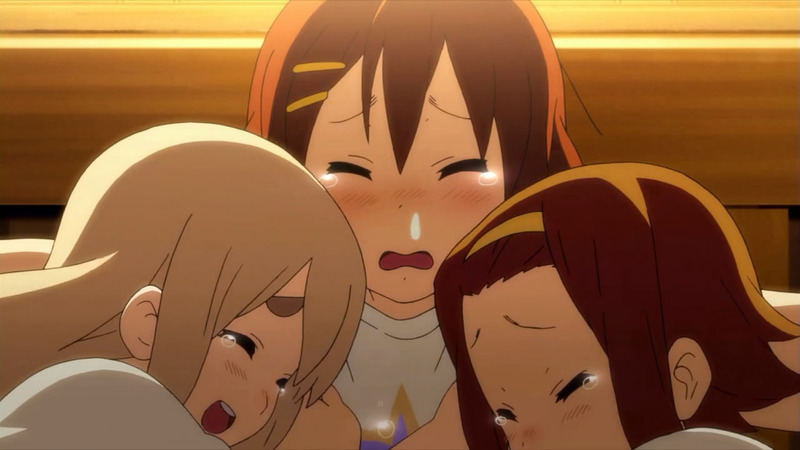 Azusa will be seen crying, I just know it. 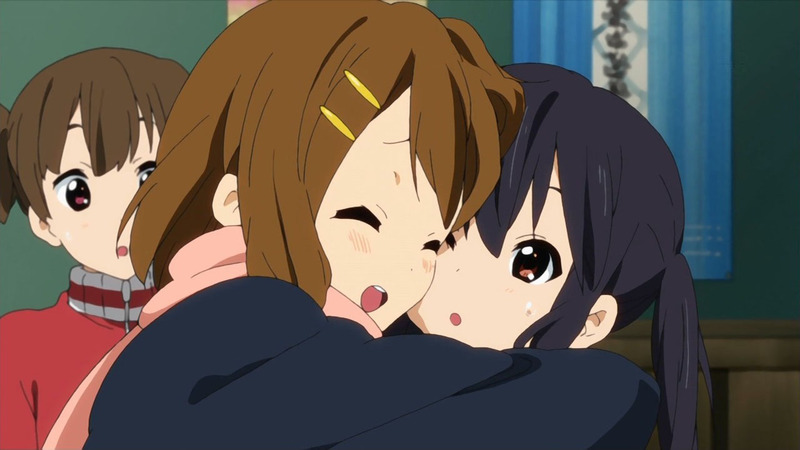 I don’t think I personally be able to handle Azunyan crying…I’d be balling with her. Man, KyoAni is making me anxious for next week. Really anxious. 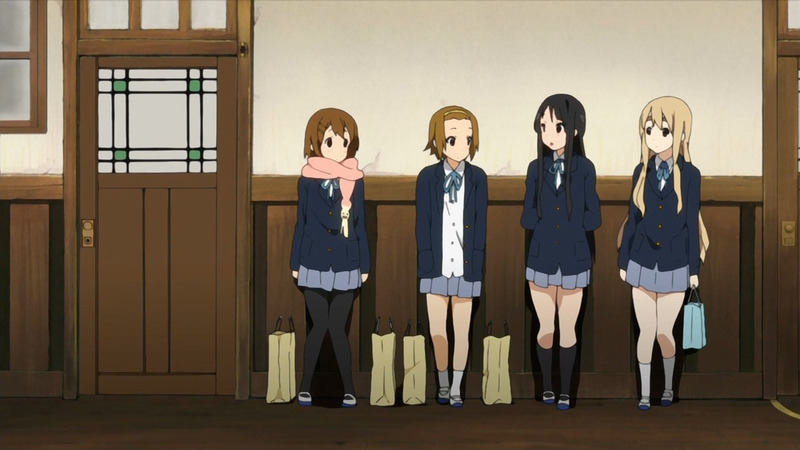 Azusa seems to be over the fact that the 4 are leaving. I guess it’s inevitable, huh? The images from Sankaku seem pretty genuine regarding the last chapter. 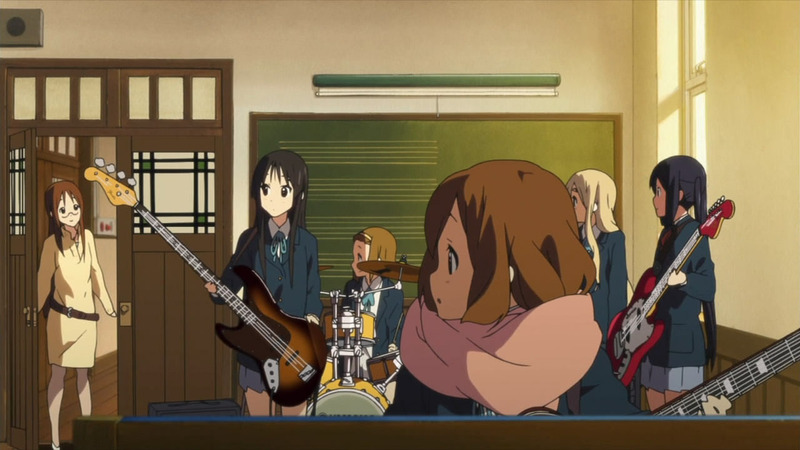 I was wondering myself if Jun and Ui will take the club members’ roles as bassist and pianist respectively, seeing at how they jammed in the music room back in episode 5. Then again, it’s back to square one since it’s going to be only the three of them. And the K=ON! dilemma will come full circle once more. Didn’t we hear “No plan” on another Kyoani show four years ago? 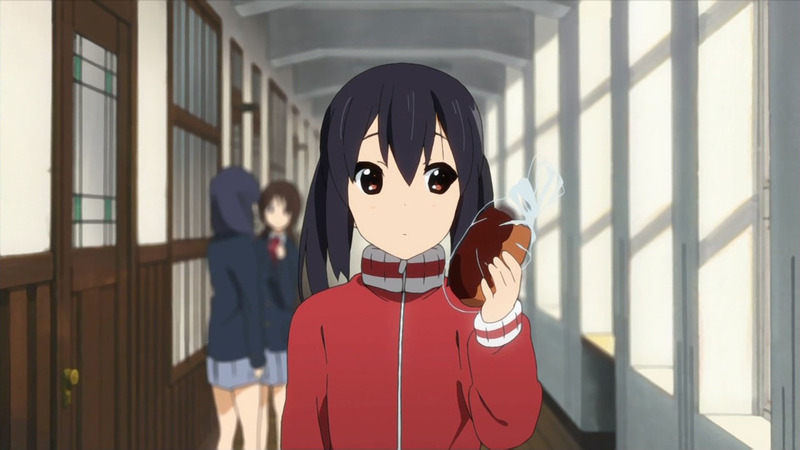 They may show that life runs in circles, so for K-ON’s Azunyan, she may meet up with a clumsy first year student and convince her to join, much like how the 3 of them met Yui. gods.. i’m already crying in advance for the next episode..
i’m pretty expecting it to be really an emotional one..
PULEEZZZ KYOANI!! HEAR MY PRAYERS!! OMG THE NEXT EPISODE IS THE LAST IN THE STORY! It came too soon! NO! I’M NOT READY! I bet those students with the corsages in the preview are new students? THE END IS NIGH! And what’s amazing is the whole episode, while lacking any climax, the fact that all this normalcy will end today merely emphasizes that sense of bittersweetness about the coming finale. You’d be surprised many people dislike listening to their voice on record, since it sounds completely different to the sound which they’re always used to hearing (mainly due to us not having to hear our voice transmit through the air as the sound is transmitted within our bodies). I count myself as one of those. Though I’ve taken a peek at the manga ending, I cannot comment on it properly without spoiling it, so I’ll wait till next week. Though most of us probably know or guess what it’s all about anyway. 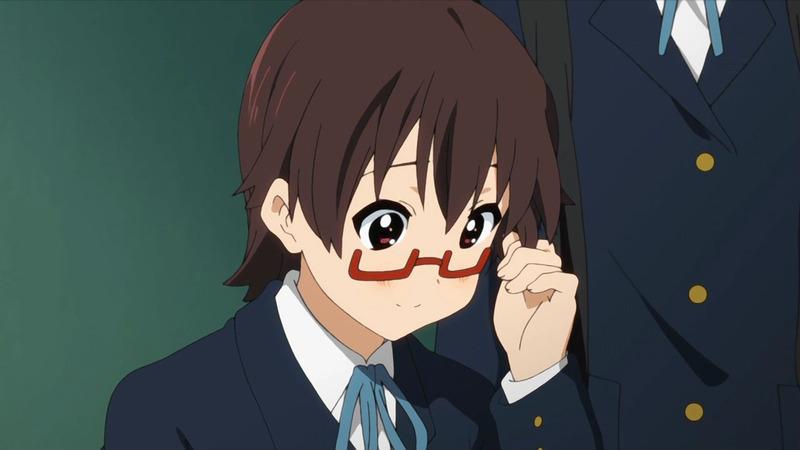 And who here likes Nodoka without her glasses? no thank you & utauyo mayacle sold about 28000 each first day. I still have the see Episode 23 but I wonder. Is Yui crying in the picture on the right side after Yui hugged Asuza? 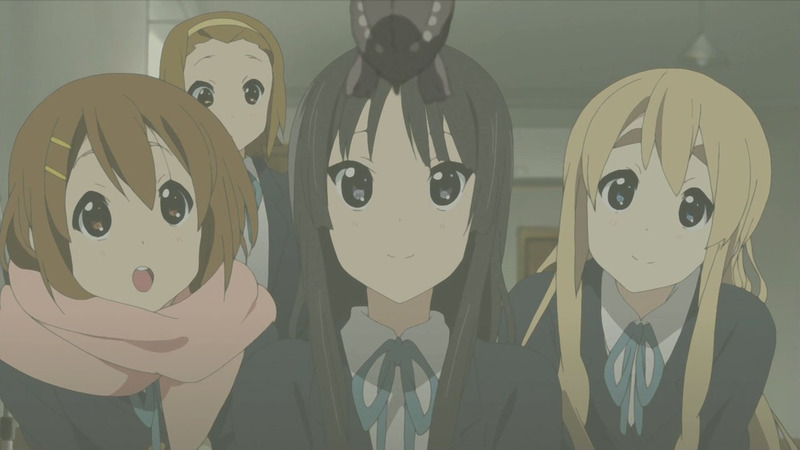 Well in one of the earlier episodes (Can’t remember which) Jun proposed about joining the club with Ui after the the seniors leave so that Azusa wouldn’t be lonely. Though that could’ve just been some random chit chat that they did. Either way it just seems natural for Jun and Ui to join (for me). 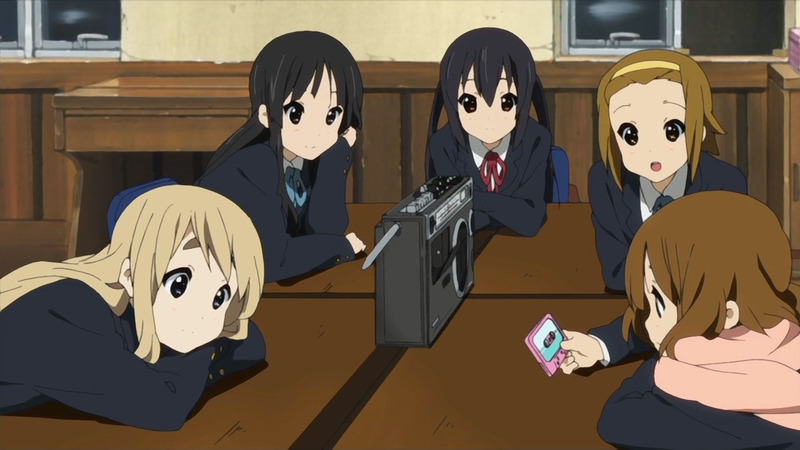 Seeing the tape recording, I have a feeling there will be a short little time skip segment to the new academic year with freshmen joining Azusa+co and listening to the tape. Jun made that ‘promise’ several times before, so if she were joking, it’d be a very cruel joke if you ask me. 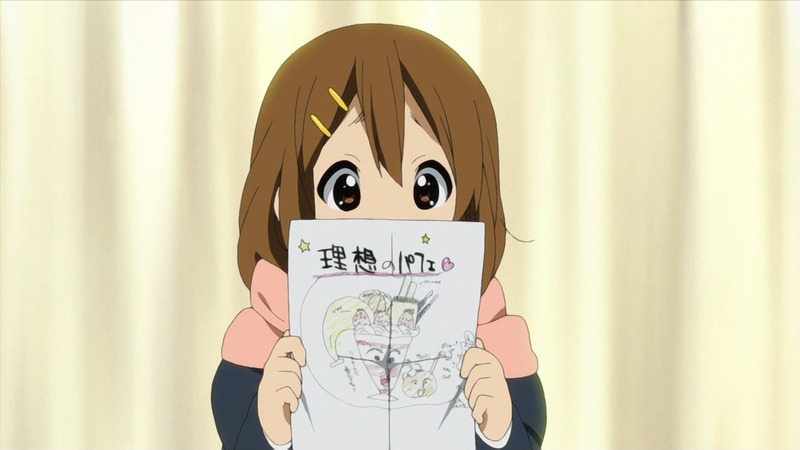 And I’m sure Azusa would never forgive her if she were trolling. Both Jun and Ui can play too, so it’s not like it’s a problem for them to join either. They need 2 more member then? For keyboard and drums…. 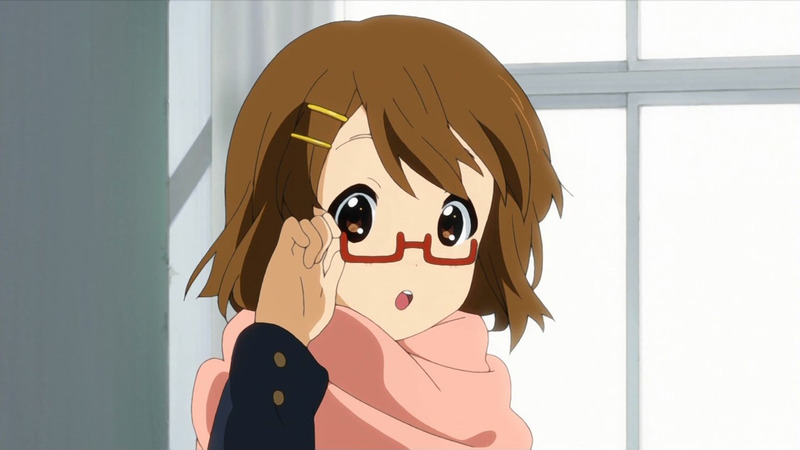 I’m expecting Azusa to bawl her eyes out in the final episode. 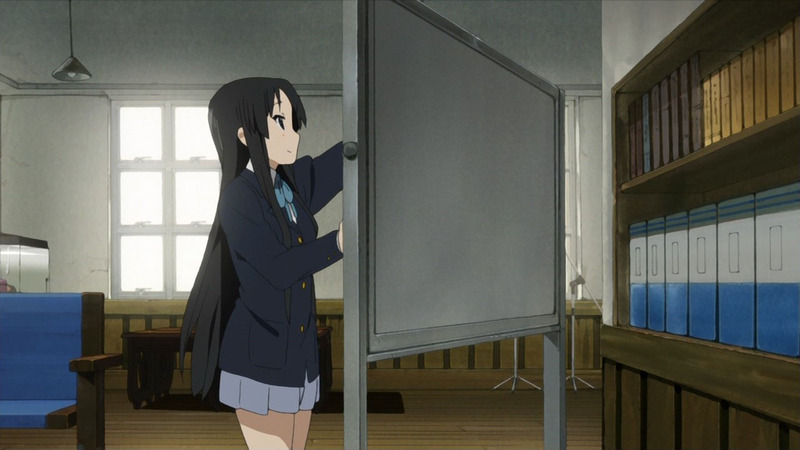 We’ve seen several times that she fears finding the clubroom empty, and seeing that fear finally come true would probably break her for real. 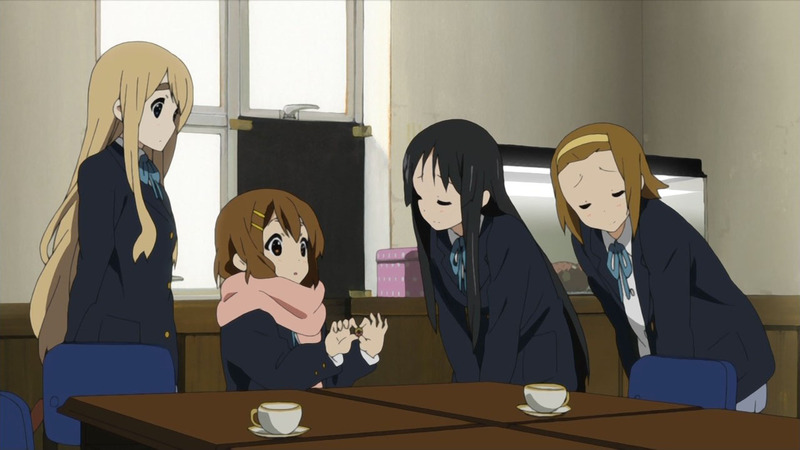 Yes it will be sad for Azusa and is only emphasized more because in the series she is displayed to always be hanging out with her upperclassmen. So when they leave we are focused on her having no one left. 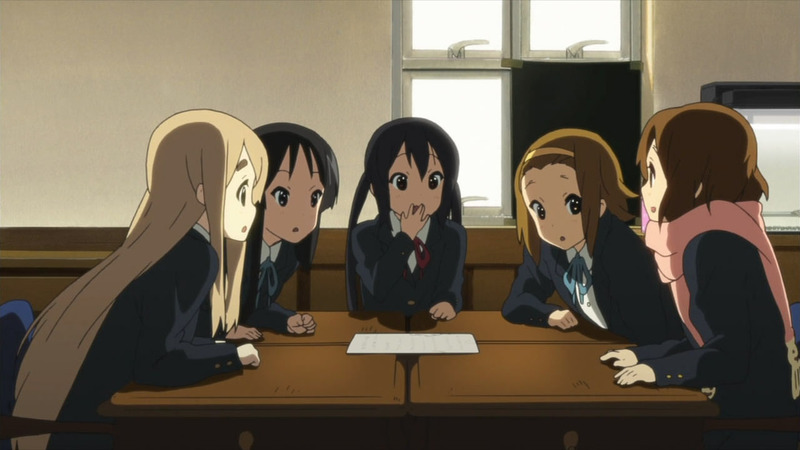 But in reality, it would be the case that Azusa would have friends in her own year that would be just as close to her as the K-on group. Whats my point? I don’t know I was just being a realist when I checked up on RC and made a random post. 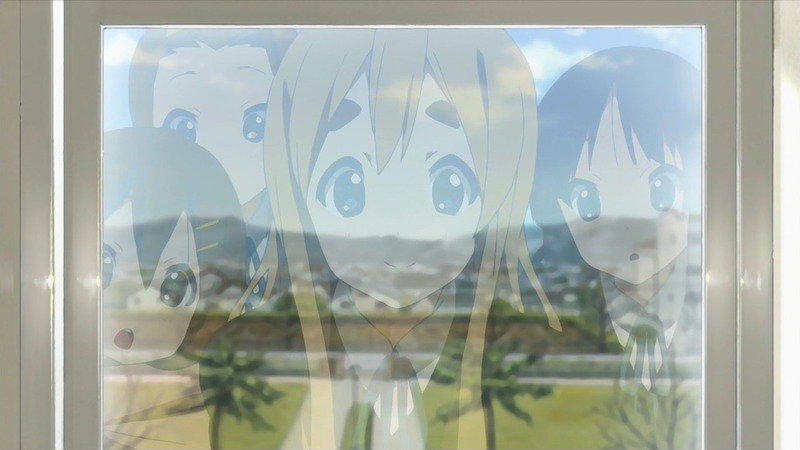 I guess that’s what they meant when they said that the end of K-ON!! will coincide with the final chapter of the manga. The next episode will be the “final” and then the last two are just bonuses. that’s not it, we need their faces as well! 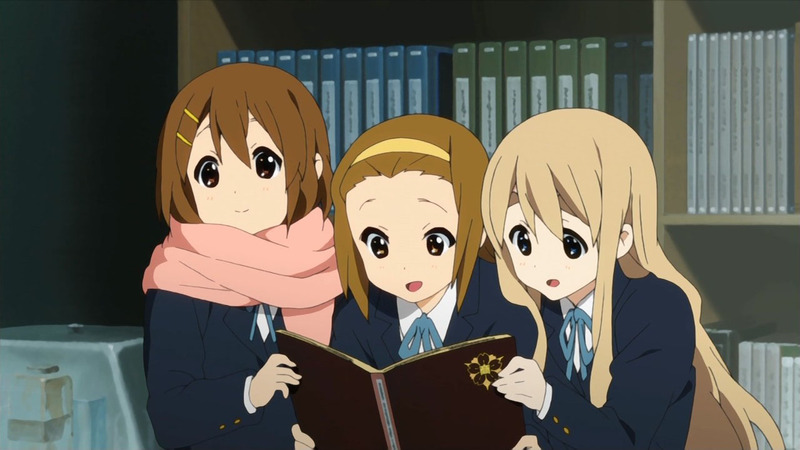 if it ends, we’ll just assuming that azusa, ui and jun succeeds k-on-bu and find another member somewhere, just like how k-on started. although this is a fantasy world, and what happens happens, think too much about it, you’ll later realize your becoming crazy. Im quite surprised that an serie that focuses on “cake and tea time” doesn’t have a single episode on birthday. I believe there are going to be three more episodes after this one. No need to panic just yet. Correction: it’s just one more aired episode, followed by two DVD ‘bonus’ episodes like in the first season. Whether there will be additional DVD/BD ones is another matter though. 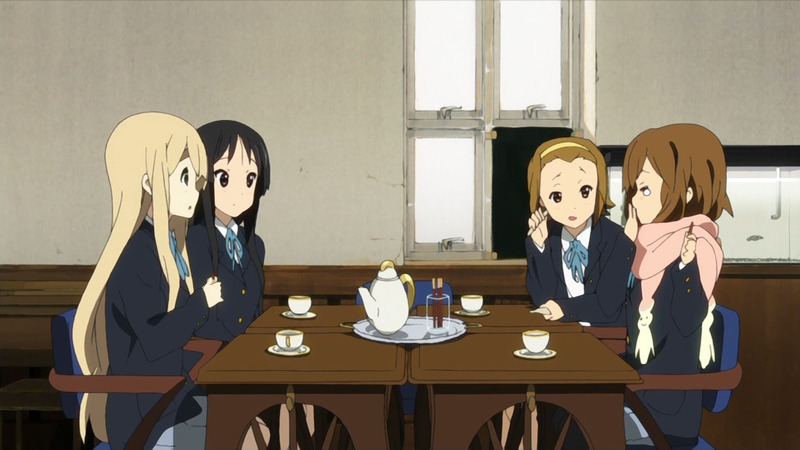 Our last hope in hearing Honey Sweet Tea Time is IF they decide to add it to a new set of character songs for Mugi. Yui will be getting a new character song album which will be released on 9/21. 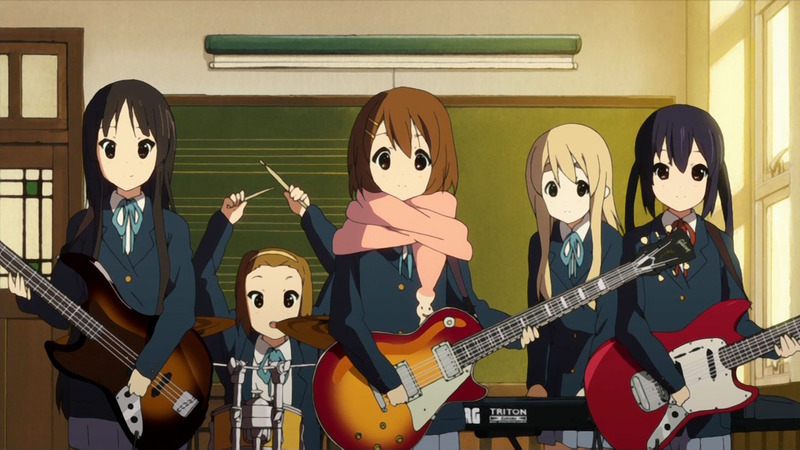 There’s also the K-On!! OST Vol.2 which will be released on 10/06. But a possible movie or an OVA might happen. 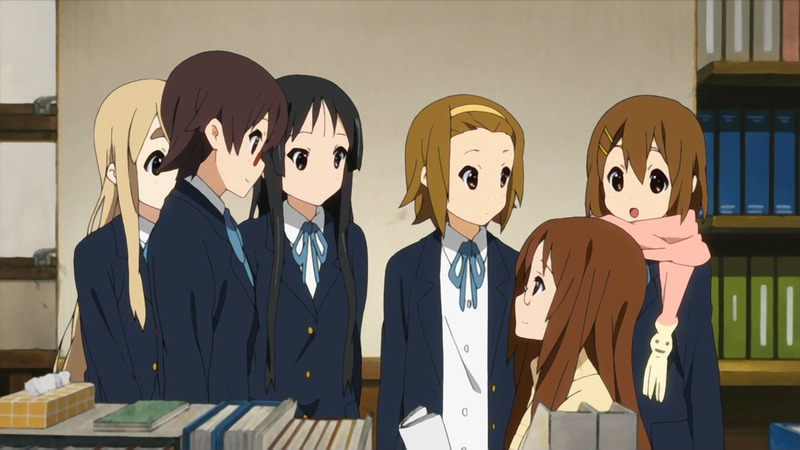 Yui, Mugi, Mio & Ritsu should be there. 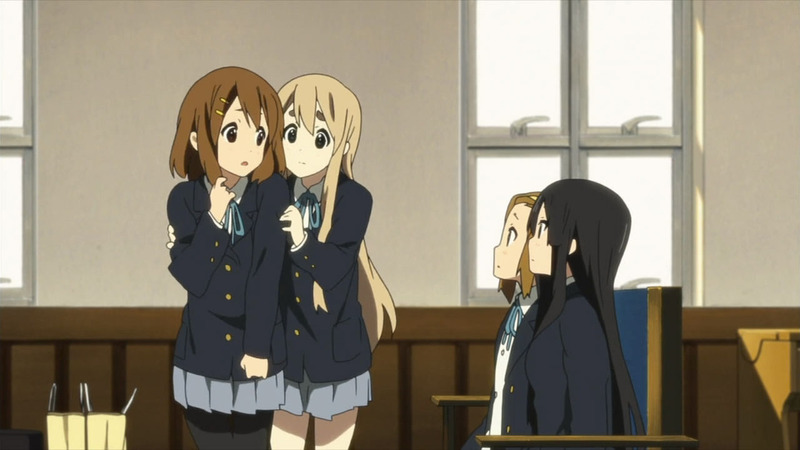 You guys remember how Jun told Azusa that she really belongs to Keion-bu? 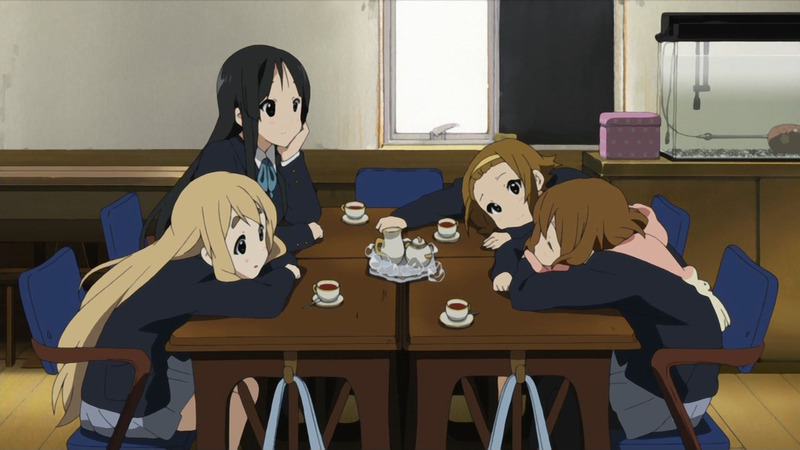 Being a Keion-bu member, you have to be sort of a slacker who loves goofing around & drinking & serving tea. 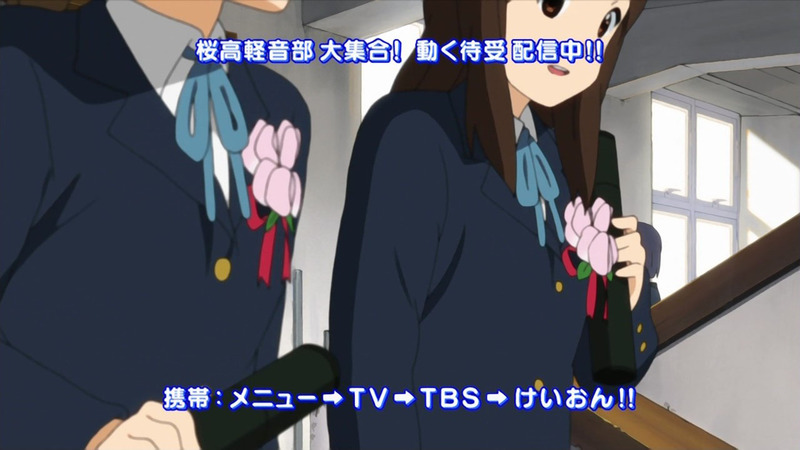 Ui & Jun aren’t Keion-bu material, see? They’re too serious *slash responsible. 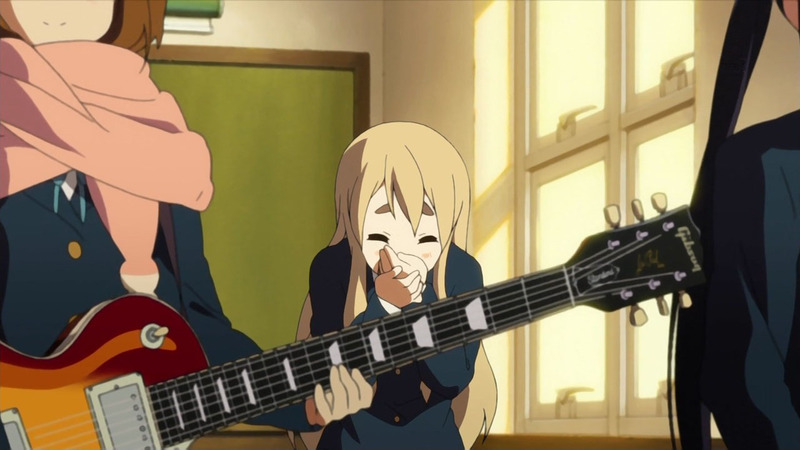 Ui is lovable & can play, but, being a Keion-bu member isn’t just about that. 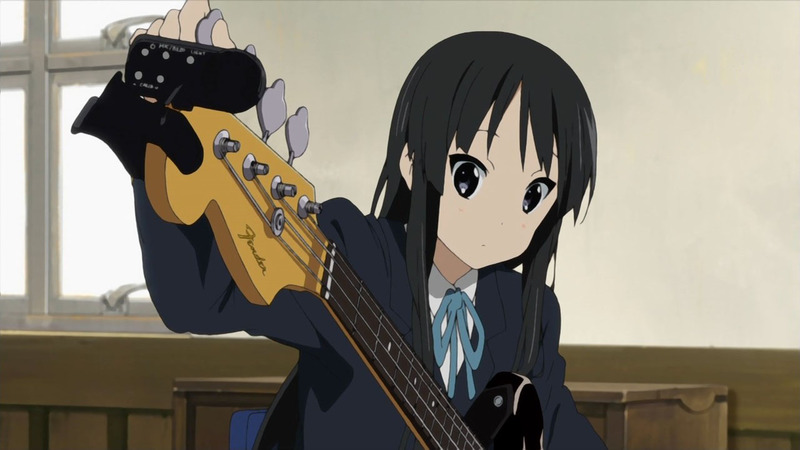 If you’ll recall, Azusa wasn’t initially a slacker, but she was converted. If they can convert Azusa, then they can surely convert Jun. But the girls won’t be there anymore to bring the slacker out of Jun. aww ~ =’( next week is the last eps hope there’ll be sp/extra eps ! I realized that the last episode was next. I can’t bring myself to feel sad that this would be the second to last episode. Part of me is a little sad though I have this other part of me saying yay the cause of the Moe Era is finally gone. 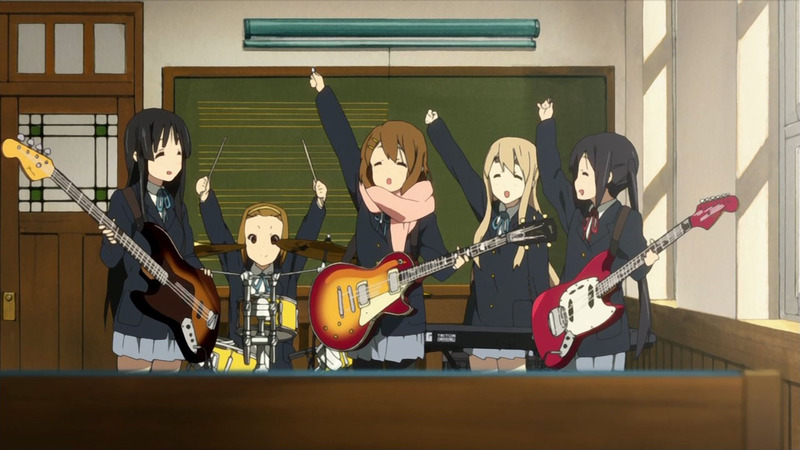 And yes K-ON was the birth of all things MOE so I’m kind of happy that its finally over. omg… I dont want the next ep but I want it too ! Aren’t the girls wearing college uniforms in the “No Thank You” ending credits? 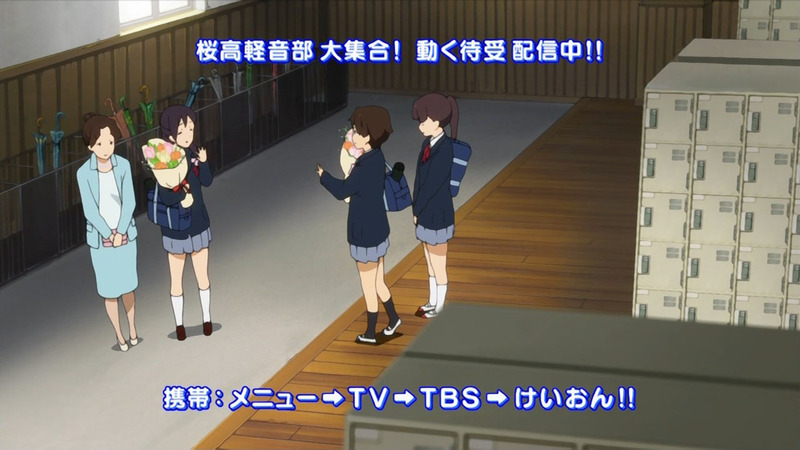 Maybe the next anime is HTT in college? as well as a few we haven’t heard.